May 12th, 2013 -A day that will live in infamy for First Mate Deidra Bridger of Tenacity Guide Service. For nearly 3 years, she has worked with Capt. Bo Johnson to help their clients not only capture a trophy fish of a lifetime, but also to capture that moment with a photo of a lifetime. Fishing clients for the mighty Silver Kind (aka Tarpon) for every fishable day of tarpon season (Mar – Oct depending on cold fronts) doesn’t provide for much opportunity to enjoy this magnificent game fish for yourself. If given a day off, the appeal of catching up on sleep or letting your exhausted body take a break from the elements vetoes the effort for yourself. However, this past Mother’s Day was reserved as a play day for Capt. Bo’s kids Kylie and Hunter. The tarpon bite had been hot south of Sanibel Island off Naps, so we chose to launch out of St James City’s Marina. After the long idle, it was a short run to cast net thread fins by the causeway and another quick run further south to our honey hole. We wasted no time baiting our hooks and casting out the Sewell Custom Rods – 2 out the back drifting and 2 on the bow ready to pitch at rollers. Paying close attention to the Lowrance side imaging, we located a pod and trolling motored into position. WHAM! The back left rod double over! Son Hunter was manning this station and quickly picked up the rod. ZING ZING ZIIINNNGGG.. three swipes of the tail and the regal scaled creature sky rocketed into the air! Not once, not twice, but three times leaping with all his force. It was a STUD!!! The aerial acrobatics played well for the fish as Hunter was left with a limp rod and a look of bewilderment. Humbled by the mighty Silver King! Up next was Kylie. Now Kylie has a reputation for catchin and killin MONSTERS (like her 400lb wild hawg!) and this occasion was no different. When the head came up on this fish’s first jump, there was no denying it was a beast. Kylie fought her fish like a pro and before we knew it, she was boatside with her 180 lb + trophy tarpon! It weighed about the same as the last one she caught, only this one didn’t get bit in half by a giant bull shark! Kylie leaned over the gunwale and released her fish, hopping up with a big smile at her successful feat. After pictures and celebration, we went back to locating fish by our scouting eyes and side imaging technology. Fish EVERYWHERE. We knew someone’s rod would get hit any second. Again, back rod doubled over and Hunter sprung to action. Line went limp and for a second we thought it was gone, but Capt Bo knew better. REEL REEL REEL son, he is swimming at you!!! Hunter cranked on the Canyon reel a few seconds when the fish suddenly realized he was hooked! This Silver Stud had some momentum when he leaped, greyhounding not 30 yds down the side of the boat. WOW!!! The jumping power of this fish was humbling as once again, it threw the hook. Back at it, First Mate D was on the bow with Capt Bo pitching baits. The side scan indicated we were on em THICK. Right as Capt Bo said, “Someone is about to get eaten”, First Mate D’s rod tip began to fall with the pull of her bait. She could hear herself say, “Oh man, Oh man.. FISH ONNNN… take it, take it.. REEL REEL REEL! !” as the drag took off screaming! She knew the fish would leap at any moment, and it did! Successfully ‘bowing to the king’ (aka dropping the rod tip and pointing at the fish), it stayed on. A big sigh of relief prefaced what would become many. With every jump and trick the fish would pull out of the ‘tarpon’s Book of Evading Anglers’, she held her breath, executed proper technique, and prayed to God this fish would be boated and that photo of a lifetime would be captured once and for all! And that is precisely what happened! First Mate D was in shock. The gorgeous fish surrendered into the hands of Capt Bo as D slipped on her gloves. She was gonna hold this bad boy in her hands and soak up every second of this accomplishment. Kylie snapped photos of the fishing duo together, all smiles, beaming with pride. This was just as much an accomplishment for Bo as it was for D. He celebrates his clients’ victory time and again, but never had done so with his own girlfriend- plus he had to hear about it every day at work LOL. First Mate D took several photos handling the fish all on her own, including a video of her release. Staring mesmerized into the giant silver scaled mirage, she saw her dream realized and a giant smile spread across her face. Holding onto the tarpon’s jaw with her right hand, dorsal in her left, she pushed the fish down/up, out/in. Revived, it swam away for to one day make the dream come true for another lucky guy or gal. This day happened to be this tarpon’s date with my destiny. THIS is my FIRST EVER tarpon not only captured by rod, but by the camera too! I am beyond STOKED. It may come as a huge shock to many of you that this is my first, being that I have taken hundreds of photos of our Tenacity Guide Service clients with their trophy tarpon. I have jumped a few and did land one in 2011 while filming and competing in the Outdoor Channel’s MadFin Shark Series (which we won) but Capt. Bo popped the hook out and told me to “re-rig! we are fishin a tournament!”.. I pretty much went into convulsions lol. So yes, I have dreamed of this moment for over 3 years now and finally I have my photo shoot with the magnificent Silver King. I feel incredibly blessed to have my boyfriend and Captain, Bo Johnson, who helped make this dream a reality. Thanks to his kids, Kylie and Hunter for sharing the experience and helping to take photos! And I gotta thank amazing gear like Sewell Custom Rods and Canyon Reels! Capt. Bo Johnson & First Mate Deidra team up to bring you the ultimate saltwater fishing experience in Southwest Florida & Key West. They offer adrenaline packed tarpon and shark action as well as family friendly backcountry redfish, seatrout, snook, developing a great reputation for quality trips. In addition to the fishing charter community, this duo is active with TV Shows, Magazine Publications, Pro-Staff Duties, Philanthropic Events, and the Tournament World. Visit them online- www.FishTenacity.com and follow them daily on Facebook- Tenacity Guide Service. 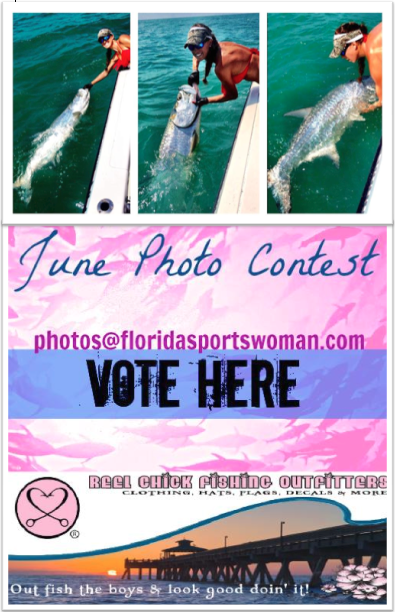 VOTE for Deidra to win the Florida Sportswoman JUNE photo contest! Click on the photo below or click HERE and “LIKE” her picture on Facebook.